Catscratch disease (CSD), also known as catscratch fever or subacute regional lymphadenitis, is a bacterial infection affecting lymph nodes that drain the sites of inoculation. Bartonella henselae, a gram-negative rod, is considered the principal etiologic agent. [1, 2] CSD is one of the most common causes of chronic lymphadenopathy in children and adolescents. 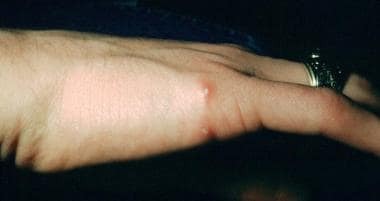 Patients with CSD usually have a history of sustaining a scratch or bite from a cat (typically a kitten). 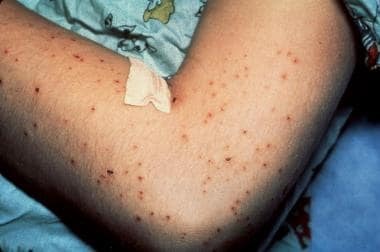 The initial symptom is formation of a papule at the inoculation site, followed by solitary or regional lymphadenopathy within 1-2 weeks (see the images below). In most patients, the disease resolves spontaneously within 2-4 months. Papulopustular lesions of a primary inoculation site on the hand of a 16-year-old patient. These lesions had been present for approximately 3 weeks. A catscratch antigen skin test was positive with 15-mm induration. No treatment was administered, and her condition resolved spontaneously in 2.5 months. Courtesy of Andrew Margileth, MD. A crusted primary inoculation papule on the neck of a 4-year-old child. Note the adjacent lymphadenitis. This patient had contact with cats and had multiple scratches. Courtesy of Andrew Margileth, MD. This 13-year-old girl developed fatigue and malaise after being licked and scratched by a cat. The typical conjunctival granuloma was accompanied by a parotid mass and intraparotid adenitis. No treatment was administered, and all her signs and symptoms resolved in 3 months. Courtesy of Andrew Margileth, MD. This 9-year-old boy developed catscratch disease (CSD) encephalitis and a papular pruritic dermatitis after sustaining cat scratches and developing regional lymphadenitis. He was in a coma for 4 days but experienced a complete and rapid recovery within 3 weeks. Biopsy of the skin rash revealed nonspecific changes. The CSD antigen skin test result was positive. Courtesy of Andrew Margileth, MD. This 2.5-year-old boy was recovering from catscratch disease acquired 10 months before when he developed this neck abscess over a period of 3 weeks. Biopsy revealed caseating granulomas; acid-fast bacillus and Warthin-Starry stain results were negative. Courtesy of Andrew Margileth, MD. Infection of immunocompromised patients with the same organism leads to a very different disease, bacillary angiomatosis-peliosis. This disease is characterized by angioproliferative lesions resembling those of Kaposi sarcoma in the skin, liver, spleen, bone, and other organs. The history of CSD has been reviewed comprehensively by Carithers  in 1970 and by Margileth  in 1987. It is summarized here. Henri Parinaud sometimes is given credit for the first description of CSD in 1889. 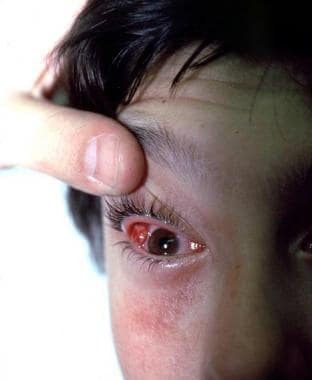 However, the oculoglandular syndrome of conjunctivitis with an enlarged preauricular lymph node that he reported ultimately was shown to comprise only a small subset of the possible clinical presentations of CSD, the result of inoculation of the CSD agent into the conjunctivae. Parinaud did not make the association with cat exposure; thus, his contribution is of limited scope. In 1931, Dr. Robert Debré and his colleague Georges Semelaigne observed an unusual case of suppurating epitrochlear adenitis in a 10-year-old boy at the University of Paris and noted a number of cat scratches on the affected side. These were believed to be portals of entry for tubercle bacilli. When the tuberculin skin test results turned out to be negative, the investigators pursued an infectious cause of feline origin. While bacteriologic investigations yielded no clues, the physicians continued to observe similar cases of spontaneously remitting regional lymphadenitis associated with cat scratches in their pediatric population. Debre postulated tularemia, pasteurellosis, infectious mononucleosis, or tuberculosis as possible etiologic agents, but with no convincing proof. Foshay, a microbiologist at the University of Cincinnati, suspected CSD to be a possible manifestation of tularemia. On meeting Debre in 1947, the 2 investigators compared notes on "catscratch disease" (Debre) and "cat fever" (Foshay). Foshay had produced an antigen from the pus of affected patients and achieved what was believed to be a diagnostic reaction after intradermal injection. Debre and his colleagues subsequently developed a similar antigen and demonstrated reactions in both old and new cases of CSD. These results were presented and published in 1950. These investigators also recorded failure of transmission of CSD to 15 different species of animals and possible human-to-human transmission in 1 of 4 cases. In 1951, Greer and Keefer published the first report of CSD in American literature, in which they described a broader spectrum of CSD manifestations. In the late 1950s, William Warwick of the University of Minnesota collaborated with Robert Good in an attempt to transmit CSD to "every variety of lab animal from the monkey to the mouse." Their only positive result was the development of cutaneous lymphadenopathy in a monkey given intracerebral injections of ground lymph nodes and pus. Discovery and classification of the etiologic agent for CSD is one of the triumphs of modern microbiology. The elegance and power of molecular taxonomy applied to the CSD agent revealed unexpected connections with other well-recognized infectious diseases and a deeper understanding of the pathogenesis of CSD. The first successful isolation and culture of the CSD organism was performed by English et al in 1988. Their further studies fulfilled Koch's postulates, and the organism was determined to be the cause of CSD. One of the isolates from the study by English et al was investigated at the US Centers for Disease Control and Prevention, along with additional specimens from Tripler Army Medical Center in Honolulu. From these specimens, the CSD organism was determined to be a new entity and given the name Afipia (from Armed Forces Institute of Pathology) felis. Reports associating another agent (Rochalimaea henselae) with CSD began appearing in 1992. Although they are not closely related, R henselae and A felis are both members of the alpha-2 subclass of Proteobacteria and share a similar microscopic appearance and affinity for the Warthin-Starry stain. When the sequences of 16S bacterial rRNA from R henselae and Bartonella were compared, these organisms were determined to be so clearly closely related that they belonged in the same genus. Because Bartonella had historical precedence, R henselae was renamed Bartonella henselae. A Medscape General Medicine article that may be of interest is " Do Bartonella Infections Cause Agitation, Panic Disorder, and Treatment-Resistant Depression? " The hallmark of CSD is regional adenopathy proximal to the site of inoculation. In immunocompetent patients, Bartonella infection causes a granulomatous and suppurative response. In immunocompromised patients, the response to Bartonella infection can be vasculoproliferative with neovascularization. Bartonella is able to promote angioproliferation through adhesin A, which is observed in bacillary angiomatosis, peliosis, and verruga peruana. Nine outer membrane proteins (OMP) of B henselae have been identified. The 43-kD OMP is a major protein capable of binding endothelial cells; further investigation is needed to clarify its role in the pathogenesis of CSD. Feline infection with B henselae is common and asymptomatic. In the United States, 28% of surveyed cats had antibodies against the organism. In California, blood cultures were positive in 56% of domestic cats younger than 1 year and in 34% of cats older than 1 year. More than three fourths of all cats in California had antibodies to B henselae as evidence of prior infection; however, only 21% of pet cats were bacteremic, compared with 61% of stray cats. A similar survey of cats in the Baltimore area found seropositivity in 12-14% of domestic cats versus 44% of feral animals. Cats can be asymptomatically bacteremic for months, even while antibody titers are developing. The organism has been isolated from fleas residing on infected cats. Studies have shown that flea-vectored transmission of infection among cats occurs with high efficiency and that in the absence of fleas, infected cats do not transmit the infection to uninfected cats. Although flea-vectored transmission to humans has not been documented, it could explain some cases in which the patient has no history of exposure to cats. Treatment of cats with doxycycline is associated with a reduction of bacteremia, but whether such treatment prevents relapse or reinfection is unknown. Familial and household clustering of cases of CSD have been reported. However, only one member of a family in contact with an infected cat usually is affected. Many organ systems are affected by CSD, including the lymph nodes, CNS, eyes (neuroretinitis), skin (bacillary angiomatosis, erythema nodosum, erythema multiforme), lungs, and bones (arthritis and osteomyelitis). In general, lymph nodes become enlarged in the 1-2 weeks after exposure. They are often tender and occasionally become fluctuant. Lymphoid hyperplasia with arteriolar proliferation and reticular cell hyperplasia is seen early in the disease. As the disease progresses, granulomas appear, with central necrosis surrounded by lymphocytes. Histiocytes and multinucleated giant cells are often present. Finally, stellate microabscesses form, and nodes can become fluctuant. Encephalopathy is the most common neurologic manifestation, occurring in 2-3% of patients. 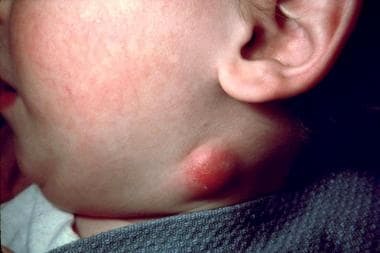 This complication may be more common in adults than in children. The onset is usually abrupt and occurs 1-6 weeks after the lymphadenopathy becomes apparent. Patients can become confused and disoriented, and their condition can deteriorate to coma. About 50% of patients have a fever. Focal findings of hemiparesis and reflex abnormalities may be noted. Seizures, which occur in as many as 80% of patients with neurologic sequelae, are often prolonged and recurrent. The pathogenesis of encephalopathy is unknown, but it is not likely due to direct infection, because CSF is usually normal and recovery is rapid, often without antibiotic therapy. CT scans are often normal, and CSF examination shows mononuclear pleocytosis in 20-30% of patients. Electroencephalographs (EEGs) show nonspecific slowing. Recovery is usually complete in a 1 week or longer, but persistent neurologic deficits have been reported. Patients with neuroretinitis generally present with painless, unilateral visual loss. Examination reveals decreased visual acuity, decreased color vision, and centrocecal scotoma. The optic disc appears edematous, and exudates frequently surround the macula. Neuroretinitis is possibly due to a subretinal angiomatous nodule similar to that seen in bacillary angiomatosis. Bacillary angiomatosis almost exclusively occurs in patients who are immunocompromised. Skin lesions consisting of numerous brown to violaceous or colorless vascular tumors of the skin and the subcutaneous tissue are the most common manifestation. Disseminated disease may involve bone, liver, spleen, lymph nodes, the gastrointestinal and respiratory tracts, and bone marrow. B henselae and Bartonella quintana have been isolated from samples of cutaneous and osseous bacillary angiomatosis lesions. Histologic examination with Warthin-Starry staining reveals vascular proliferation with numerous bacillary organisms. Six cases of CSD with pneumonia and 8 cases with pleural thickening and/or effusion have been reported. In these cases, pulmonary features developed 1-5 weeks after lymphadenopathy occurred. Systemic signs of infection, including fever, were present in 85%. One case in which a massive abscess involved the chest wall has been reported. Rolain et al have described vertebral osteomyelitis with splenic abscess in a patient with CSD. B henselae was specifically identified as the etiological agent using several direct and indirect methods, including histologic and serologic assays, as well as immunofluorescent detection on slide appositions using a monoclonal antibody. This represents the second case of osteomyelitis associated with CSD. Catscratch disease is usually caused by B henselae, formerly known as Rochalimaea henselae. B henselae is a small, fastidious, slow-growing, gram-negative, aerobic, nonmotile, pleomorphic bacillus. In the genus Bartonella, B bacilliformis, B quintana, B elizabethae, B vinsonii, and B koehlerae are also responsible for human disease. B clarridgeiae, has rarely been associated with cases of CSD. Studies have demonstrated B henselae seropositivity rates ranging from 3.1-61.6% in the general population, depending on the country in which the study was performed. In all instances, few patients ever experienced symptoms, suggesting that only a minority of exposures to B henselae result in CSD. Domestic cats are the natural reservoir and vectors of B henselae. In cats, B henselae infection is asymptomatic. Fleas are believed to transmit the bacteria between cats, and seroprevalence in cats is highest in warm or humid climates, where prevalence of flea infestation among cats is higher. The transmission of B henselae from cats to humans occurs via a scratch or bite when the bacterium is present on the cat’s claws or oral cavity. More than 90% of patients with CSD have a recent history of contact with a cat, usually a kitten, and about 75% of these patients give a history of cat scratch or bite. Dogs have been implicated in 5% of cases. [25, 26] Occasional cases of infection associated with monkey bites have also been reported. Kittens younger than 12 months are 15 times more likely to transmit the disease than adult cats. Kittens are more likely to be bacteremic with B henselae and are more likely to scratch. Individuals who have been scratched or bitten by a kitten are 27 times more likely to become infected, and people who have at least one kitten with fleas are 29 times more likely to become infected than people whose animals were free of fleas. In approximately 1% of diagnosed cases, no animal scratch is implicated. Person-to-person transmission has not been documented. No evidence exists to suggest transmission from cat fleas to humans. Ticks and biting flies have also recently been recognized as potential vectors. Cases occurring after scratches from thorns, wood splinters, and crab claws have occurred. However, in each of these cases, the patient recalled that a cat licked the abrasion. Familial outbreaks have been documented and have usually involved siblings, or in rare instances parents. Symptoms among siblings often appear within 3 weeks of the index case. Cases of CSD occur throughout the United States. The incidence is greater in regions with higher temperatures and humidity (eg, Hawaii, Pacific Northwest, southeastern states, coastal California), while Alaska, the Rocky Mountains, and midwestern states have a prevalence lower than the median. Only 1 genotype of B henselae has been reported in North America. Approximately 70-90% of CSD cases occur in the fall and early winter months. This seasonality is presumed to be due to a midsummer rise in kitten births accompanied by increased flea infestation. Reynolds et al found that the CSD-associated hospitalization rate in the United States was 0.60 per 100,000 patients younger than 18 years and 0.86 per 100,000 patients younger than 5 years. The median hospitalization charge for catscratch disease has been estimated to be $46,140, and annual expenses are estimated to be about $3.5 million. CSD disease has been reported worldwide; however, the international incidence is unknown. Seroprevalence rates vary greatly throughout the world, ranging from 0.6-37% and reflecting cat populations in each country. The disease is more prevalent in areas with warm humid climates. In some case series, CSD occurs more frequently in males than females (male-to-female ratio of 3:2), while others show equal rates between males and females. One hypothesis to explain a greater incidence among males is the tendency toward rougher play with kittens and cats and consequently an increased risk of bites and scratches. In a database analysis by Jackson et al, 55% of patients with CSD were 18 years of age or younger. Older literature suggests that more than 80% of cases occur in persons younger than 21 years. The younger age of individuals most likely to acquire CSD reflects their likelihood of exposure to the major risk factor (ie, kittens). On the other hand, a bias may exist in the literature because pediatricians have collected many of the large case series. Lymphadenitis usually resolves spontaneously over 2-4 months, but 1-2 years may be required. One episode of catscratch disease confers lifelong immunity to children and adolescents. Recurrent lymphadenopathy 6-13 months after the initial diagnosis has been reported in 3 adults with CSD. Immunocompromised patients may experience a dramatic and potentially life-threatening course of disease. However, with appropriate antibiotic use and management of complications, these patients also typically experience full resolution of disease. Assure parents that the disease will resolve spontaneously and that an episode of CSD confers long-term immunity. Although rare, adults can have recurrent illnesses. Teaching children how to handle pets gently and declawing pets may decrease the incidence of CSD. The animal is infectious for only a short period, so removal of the pet from the home is not recommended. Advise patients and caregivers to control fleas on kittens to prevent spread of B henselae infection among animals. Bergman AM, Groothedde J-W, Schellekens JFP et al. Etiology of catscratch disease: a comparison of polymerase chain reaction detection of Bartonella and Afipia felis DNA with serology and skin tests. J Infect Dis. 1995. 171:916-923. Regnery R, Tappero J. Unraveling mysteries associated with cat-scratch disease, bacillary angiomatosis, and related syndromes. Emerg Infect Dis. 1995 Jan-Mar. 1(1):16-21. [Medline]. [Full Text]. Carithers HA. Cat-scratch disease. An overview based on a study of 1,200 patients. Am J Dis Child. 1985 Nov. 139(11):1124-33. [Medline]. Moriarty RA, Margileth AM. Cat scratch disease. Infect Dis Clin North Am. 1987 Sep. 1(3):575-90. [Medline]. Abbasi S, Chesney PJ. Pulmonary manifestations of cat-scratch disease; a case report and review of the literature. Pediatr Infect Dis J. 1995 Jun. 14(6):547-8. [Medline]. Chrousos GA, Drack AV, Young M, Kattah J, Sirdofsky M. Neuroretinitis in cat scratch disease. J Clin Neuroophthalmol. 1990 Jun. 10(2):92-4. [Medline]. de Kort JG, Robben SG, Schrander JJ, van Rhijn LW. Multifocal osteomyelitis in a child: a rare manifestation of cat scratch disease: A case report and systematic review of the literature. J Pediatr Orthop B. Jul 2006. 15(4):285-8. Giladi M,Champion I, Haake DA et al. Use of the blue hallo assay in the identification of genes encoding exported proteins with cleavable signal peptides:cloning of Borrelia burgdorferi plasmid gene with a signal peptide. J Bacteriol. 1993. 175:4129-4136. Marra CM. Neurologic complications of Bartonella henselae infection. Curr Opin Neurol. 1995 Jun. 8(3):164-9. [Medline]. Walvogel K, Regnery RL, Anderson BE et al. Disseminated catscratch disease: detection of R.henselae in affected tissue. Eur. J. Pediatr. 1994. 153:23-27. Rolain JM, Lepidi H, Zanaret M et al. Lymph node biopsy specimens and diagnosis of catscratch disease: discussion. Emerg Infect Dis. Sep 2006. 12(9):1338 -44. Avidor B, Kletter Y, Abulafia S, Golan Y, Ephros M, Giladi M. Molecular diagnosis of cat scratch disease: a two-step approach. J Clin Microbiol. 1997 Aug. 35(8):1924-30. [Medline]. [Full Text]. Carithers HA. Cat-scratch disease; notes on its history. Am J Dis Child. 1970 Mar. 119(3):200-3. [Medline]. Margileth AM. The diagnostic challenge of cat scratch disease. Infect Med. 1987. 57-75. Parinaud H. Conjonctivite infectieuse transmise par les animaux. Ann Oculistique. 1889. 101:252-253. Debre R, Lamy M, Jammet ML. La maladie des griffes de chat. Semin Hop Paris. 1950. 26:1895-901. GREER WE, KEEFER CS. Cat-scratch fever; a disease entity. N Engl J Med. 1951 Apr 12. 244(15):545-8. [Medline]. Wear DJ, Margileth AM, Hadfield TL, Fischer GW, Schlagel CJ, King FM. Cat scratch disease: a bacterial infection. Science. 1983 Sep 30. 221(4618):1403-5. [Medline]. Margileth AW, Wear DJ, Hadfield TL, Schlagel CJ, Spigel GT, Muhlbauer JE. Cat-scratch disease. Bacteria in skin at the primary inoculation site. JAMA. 1984 Aug 17. 252(7):928-31. [Medline]. English CK, Wear DJ, Margileth AM, Lissner CR, Walsh GP. Cat-scratch disease. Isolation and culture of the bacterial agent. JAMA. 1988 Mar 4. 259(9):1347-52. [Medline]. Alkan S, Morgan MB, Sandin RL, Moscinski LC, Ross CW. Dual role for Afipia felis and Rochalimaea henselae in cat-scratch disease. Lancet. 1995 Feb 11. 345(8946):385. [Medline]. Dolan MJ, Wong MT, Regnery RL, Jorgensen JH, Garcia M, Peters J, et al. Syndrome of Rochalimaea henselae adenitis suggesting cat scratch disease. Ann Intern Med. 1993 Mar 1. 118(5):331-6. [Medline]. Zangwill KM, Hamilton DH, Perkins BA, Regnery RL, Plikaytis BD, Hadler JL, et al. Cat scratch disease in Connecticut. Epidemiology, risk factors, and evaluation of a new diagnostic test. N Engl J Med. 1993 Jul 1. 329(1):8-13. [Medline]. Rolain JM, Chanet V, Laurichesse H, Lepidi H, Beytout J, Raoult D. Cat scratch disease with lymphadenitis, vertebral osteomyelitis, and spleen abscesses. Ann N Y Acad Sci. 2003 Jun. 990:397-403. [Medline]. Da Silva K, Chussid S. Cat scratch disease: clinical considerations for the pediatric dentist. Pediatr Dent. 2009 Jan-Feb. 31(1):58-62. [Medline]. Chen TC, Lin WR, Lu PL, Lin CY, Chen YH. Cat scratch disease from a domestic dog. J Formos Med Assoc. 2007 Feb. 106(2 Suppl):S65-68. [Medline]. Chomel BB, Kasten RW. Bartonellosis, an increasingly recognized zoonosis. J Appl Microbiol. 2010 Sep. 109(3):743-50. [Medline]. Lin JW, Chen CM, Chang CC. Unknown fever and back pain caused by Bartonella henselae in a veterinarian after a needle puncture: a case report and literature review. Vector Borne Zoonotic Dis. 2011 May. 11(5):589-91. [Medline]. Jackson LA, Perkins BA, Wenger JD. Cat scratch disease in the United States: an analysis of three national databases. Am J Public Health. 1993 Dec. 83(12):1707-11. [Medline]. [Full Text]. Reynolds MG, Holman RC, Curns AT, O'Reilly M, McQuiston JH, Steiner CA. Epidemiology of cat-scratch disease hospitalizations among children in the United States. Pediatr Infect Dis J. 2005 Aug. 24(8):700-4. [Medline]. Sanguinetti-Morelli D, Angelakis E, Richet H, Davoust B, Rolain JM, Raoult D. Seasonality of cat-scratch disease, France, 1999-2009. Emerg Infect Dis. 2011 Apr. 17(4):705-7. [Medline]. Ridder GJ, Boedeker CC, Technau-Ihling K, Grunow R, Sander A. Role of cat-scratch disease in lymphadenopathy in the head and neck. Clin Infect Dis. 2002 Sep 15. 35(6):643-9. [Medline]. Fouch B, Coventry S. A case of fatal disseminated Bartonella henselae infection (cat-scratch disease) with encephalitis. Arch Pathol Lab Med. 2007 Oct. 131(10):1591-4. [Medline]. Gerber JE, Johnson JE, Scott MA, Madhusudhan KT. Fatal meningitis and encephalitis due to Bartonella henselae bacteria. J Forensic Sci. 2002 May. 47(3):640-4. [Medline]. Mosbacher ME, Klotz S, Klotz J, Pinnas JL. Bartonella henselae and the potential for arthropod vector-borne transmission. Vector Borne Zoonotic Dis. 2011 May. 11(5):471-7. [Medline]. Malatack JJ, Jaffe R. Granulomatous hepatitis in three children due to cat-scratch disease without peripheral adenopathy. An unrecognized cause of fever of unknown origin. Am J Dis Child. 1993 Sep. 147(9):949-53. [Medline]. Cheung VW, Moxham JP. Cat scratch disease presenting as acute mastoiditis. Laryngoscope. 2010. 120 Suppl 4:S222. [Medline]. Florin TA, Zaoutis TE, Zaoutis LB. Beyond cat scratch disease: widening spectrum of Bartonella henselae infection. Pediatrics. 2008 May. 121(5):e1413-25. [Medline]. Carithers HA, Margileth AM. Cat-scratch disease. Acute encephalopathy and other neurologic manifestations. Am J Dis Child. 1991 Jan. 145(1):98-101. [Medline]. Centers for Disease Control and Prevention. Encephalitis associated with cat scratch disease--Broward and Palm Beach Counties, Florida, 1994. MMWR Morb Mortal Wkly Rep. 1994 Dec 16. 43(49):909, 915-6. [Medline]. Pampe D, Holt RM. Cat scratch disease with reversible encephalopathy. Tex Med. 1984 Feb. 80(2):38-9. [Medline]. Pollen RH. Cat-scratch encephalitis. Neurology. 1968 Oct. 18(10):1031-3. [Medline]. Cherinet Y, Tomlinson R. Cat scratch disease presenting as acute encephalopathy. Emerg Med J. 2008 Oct. 25(10):703-4. [Medline]. Pickerill RG, Milder JE. Transverse myelitis associated with cat-scratch disease in an adult. JAMA. 1981 Dec 18. 246(24):2840-1. [Medline]. François J, Verriest G, De Laey JJ. Leber's idiopathic stellate retinopathy. Am J Ophthalmol. 1969 Aug. 68(2):340-5. [Medline]. Raoult D, Fournier PE, Drancourt M, Marrie TJ, Etienne J, Cosserat J, et al. Diagnosis of 22 new cases of Bartonella endocarditis. Ann Intern Med. 1996 Oct 15. 125(8):646-52. [Medline]. Hajjaji N, Hocqueloux L, Kerdraon R, Bret L. Bone infection in cat-scratch disease: a review of the literature. J Infect. 2007 May. 54(5):417-21. [Medline]. Mirakhur B, Shah SS, Ratner AJ, Goldstein SM, Bell LM, Kim JO. Cat scratch disease presenting as orbital abscess and osteomyelitis. J Clin Microbiol. 2003 Aug. 41(8):3991-3. [Medline]. [Full Text]. ten Hove CH, Gubler FM, Kiezebrink-Lindenhovius HH. Back pain in a child caused by cat scratch disease. Pediatr Infect Dis J. 2009 Mar. 28(3):258. [Medline]. Abarca K, Winter M, Marsac D, Palma C, Contreras AM, Ferrés M. [Accuracy and diagnostic utility of IgM in Bartonella henselae infections]. Rev Chilena Infectol. 2013 Apr. 30(2):125-8. [Medline]. Vermeulen MJ, Verbakel H, Notermans DW, Reimerink JH, Peeters MF. Evaluation of sensitivity, specificity and cross-reactivity in Bartonella henselae serology. J Med Microbiol. Mar 2010;(Epub ahead of print). 59:743-5. [Medline]. Huang J, Dai L, Lei S, et al. [Application of Warthin-Starry stain, immunohistochemistry and transmission electron microscopy in diagnosis of cat scratch disease]. Zhonghua Bing Li Xue Za Zhi. 2010 Apr. 39(4):225-9. [Medline]. Wang CW, Chang WC, Chao TK, Liu CC, Huang GS. Computed tomography and magnetic resonance imaging of cat-scratch disease: a report of two cases. Clin Imaging. 2009 Jul-Aug. 33(4):318-21. [Medline]. Min KW, Reed JA, Welch DF et al. Morphologically variable bacilli of catscratch disease identified by immunocytochemical labeling with antibodies to Rochalimaea Henselae. Am. J. Clin. Pathol. 1994. 101:607-610. Dharnidharka VR, Richard GA, Neiberger RE, Fennell RS 3rd. Cat scratch disease and acute rejection after pediatric renal transplantation. Pediatr Transplant. 2002 Aug. 6(4):327-31. [Medline]. Bass JW, Freitas BC, Freitas AD, Sisler CL, Chan DS, Vincent JM, et al. Prospective randomized double blind placebo-controlled evaluation of azithromycin for treatment of cat-scratch disease. Pediatr Infect Dis J. 1998 Jun. 17(6):447-52. [Medline]. Margileth AM. Antibiotic therapy for cat-scratch disease: clinical study of therapeutic outcome in 268 patients and a review of the literature. Pediatr Infect Dis J. 1992 Jun. 11(6):474-8. [Medline]. Musso D, Drancourt M, Raoult D. Lack of bactericidal effect of antibiotics except aminoglycosides on Bartonella (Rochalimaea) henselae. J Antimicrob Chemother. 1995 Jul. 36(1):101-8. [Medline]. Ives TJ, Manzewitsch P, Regnery RL, Butts JD, Kebede M. In vitro susceptibilities of Bartonella henselae, B. quintana, B. elizabethae, Rickettsia rickettsii, R. conorii, R. akari, and R. prowazekii to macrolide antibiotics as determined by immunofluorescent-antibody analysis of infected Vero cell monolayers. Antimicrob Agents Chemother. 1997 Mar. 41(3):578-82. [Medline]. [Full Text]. Holley HP Jr. Successful treatment of cat-scratch disease with ciprofloxacin. JAMA. 1991 Mar 27. 265(12):1563-5. [Medline]. Bogue CW, Wise JD, Gray GF, Edwards KM. Antibiotic therapy for cat-scratch disease?. JAMA. 1989 Aug 11. 262(6):813-6. [Medline]. Koehler JE, LeBoit PE, Egbert BM, Berger TG. Cutaneous vascular lesions and disseminated cat-scratch disease in patients with the acquired immunodeficiency syndrome (AIDS) and AIDS-related complex. Ann Intern Med. 1988 Sep 15. 109(6):449-55. [Medline]. This 10-year-old child had contact with dogs but not cats. The impressive lymphadenitis had been present for 5 weeks and was not tender. Pathologic examination of a biopsy specimen of the lymph node revealed nonspecific changes. She had a positive catscratch disease skin test result and negative purified protein derivative skin test results. Treatment with cephalexin was administered with a good response. Complete resolution occurred in 4.5 months. Courtesy of Andrew Margileth, MD. Warthin-Starry stained sections of lymph node showing chains and clusters of organisms. Courtesy of Andrew Margileth, MD.